You walked up the flight of stairs following other darkly dressed figures. Once you got an “X” on your hand with a black sharpie you were ready to enter. It was dark with glowing accents all around as gloomy music echoed through hung cobwebs. The mood was perfect, this was Goth Prom. 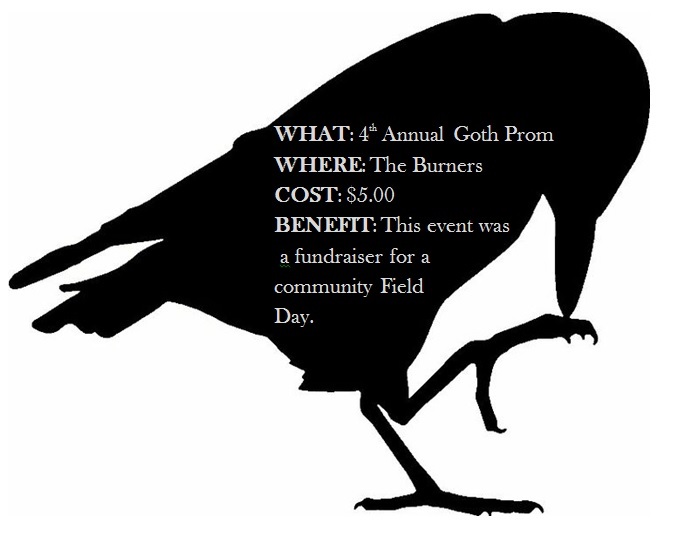 The event took place at The Burners, which already sounds like the perfect dismal environment to throw a Goth Prom. I didn’t know what “The Burners” was until I Google mapped the location. It is St. Bernard’s Home of the Good Samaritan on Brodhead Ave. – if you are local, it is across from the Hess station. I had always wondered what that building was – and now I know. Lehigh Valley Live had a write-up on the place back in July 2013, which can be found here. Since The Burners does not have a large internet presence, this article was great in finding out more about this venue. I was pleasantly surprised with The Burners. The attic of the building suited the Goth Prom perfectly. Once you got to the top of a narrow staircase there is one doorway to the left. Once in the doorway, there is a dance floor that was broken into a dance space and then a photography space. Yes, there was a place to take your phony prom picture in goth attire. The setup was delightful and subtleties not unnoticed – from the webbed plants to the framed creatures of the night silhouettes. Far across the dance floor was a decent sized bar serving two types of beer on tap, some mixed drinks, and solo cups full of boxed wine. I fancied the bar selection as I felt it was nostalgic of a house party full of angry youths dressed in black. Everything just fit so well for the event. I think a lot of the hype came from Facebook, where it was largely promoted. Attendees kept posting goth-themed pictures or jokes leading up to the event such as, “I am too depressed to go to Goth Prom, do I win?” The music also fit as nearly the whole room sang along to Korn’s “Freak on a Leash.” In all, the prom was a reunion of a lot of misfits in high school going back to their darker roots. An opportunity to dress up, cake eyeliner on, and have a good time with friends. The only qualm I had with the whole event was the smoking. It was a smaller venue and the smoke lingered in the air. This is more of a personal issue than an overall con to the event. Due to this, I did not get to see who was crowned Prom King and Queen. I did have the honor of seeing some pretty amazing outfits though. I enjoyed watching the one gentleman dance dressed with a black sweatsuit that was printed with a white skeleton. I also admired the Hawaiian lei of doll heads another gentleman wore. In all, it was a really unique event that was still small and intimate and an excuse to pull out some dark clothing, pout some black lips, and dance to the songs of your introspective teen days.